First Alert Action Day: Dry in Denver for now, snow developing in the mountains. Monday evening forecast with Mike Nelson. DENVER — The mild weather will continue for the Denver area for one more day, but snow is already hitting the mountains. A FIRST ALERT ACTION DAY has been issued for Wednesday and Thursday due to an upcoming round of snow and cold. A Winter Storm Watch has been issued for most of the Colorado High Country for Tuesday afternoon through early Thursday. Snow will be moderate to heavy at times and will total 12-18 inches of snow. Gusty winds and poor visibility will be an issue in the high country. For Denver and the eastern plains, expect a mild and dry day, with an increase in clouds ahead of the next cold front. Temperatures will remain above normal with highs in the upper 40s to low 50s across the Denver metro-area. Winds will be gusty at times from the southwest. 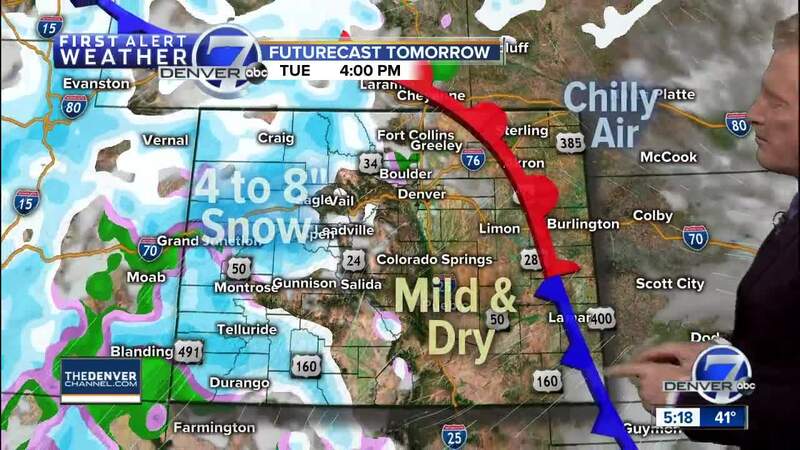 The next snow maker for Denver and the eastern plains will move in Wednesday afternoon. The Wednesday morning commute looks dry, but snow will move in for the evening drive. Temperatures will be about 15 to 20 degrees colder, with highs only in the 30s on Wednesday afternoon. As of now, it looks like the metro area can expect around 3-4 inches of snow with this storm through Thursday morning. Travel will be slick and slow for Thursday morning. Temperatures will be very cold, dropping to the single digits in Denver. Be prepared to allow a good 45-60 minutes extra for the morning commute. Thursday is the coldest day on the 7-day forecast. Highs will only be in the 20s. Skies will clear out as we head into the weekend. Temperatures are expected to rebound to the upper 30s and low 40s Friday through Sunday.